Payroll management is an important endeavor that every big and small company must undertake in order to ensure that salaries of employees and other staff are being wired or distributed in an accurate and organized manner. In many companies, payroll forms of different types are presented and submitted in order to tackle different situations. It could be a simple deduction of salary or something even more complex. 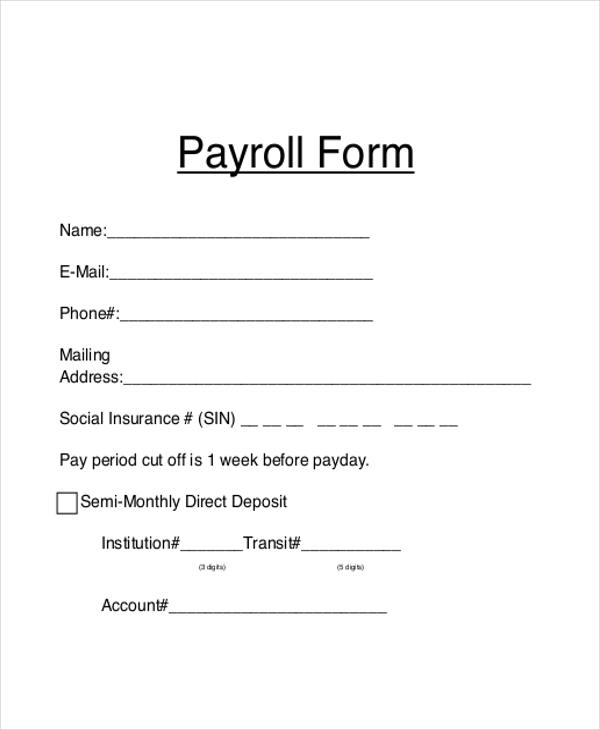 Payroll forms are important and play an important role. In order to understand how much company revenue has gone into the payroll of employees in a calendar year, an annual payroll form is ideally populated with all the relevant information and details pertaining to worker payroll information. 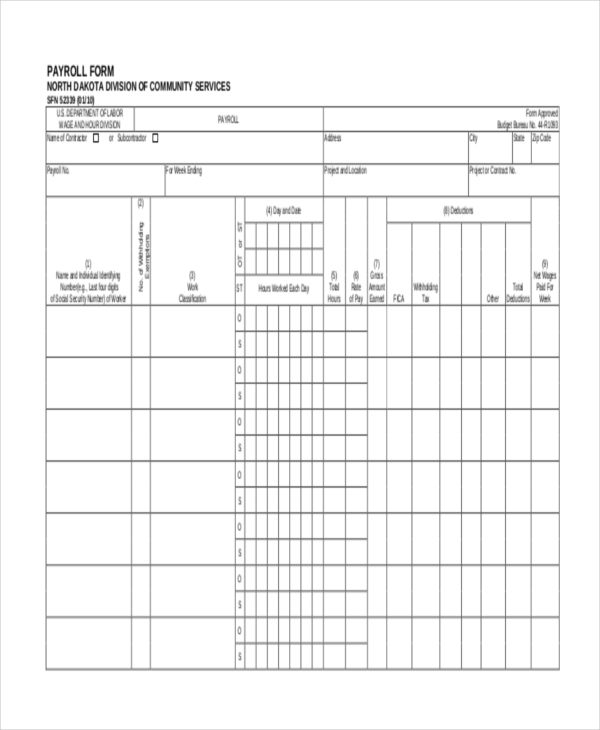 A payroll form is generally in tabular form. One or more tables are created with multiple columns wherein different kinds of payroll-related information of a company’s workers needs to be furnished along with properly calculated sums and figures. 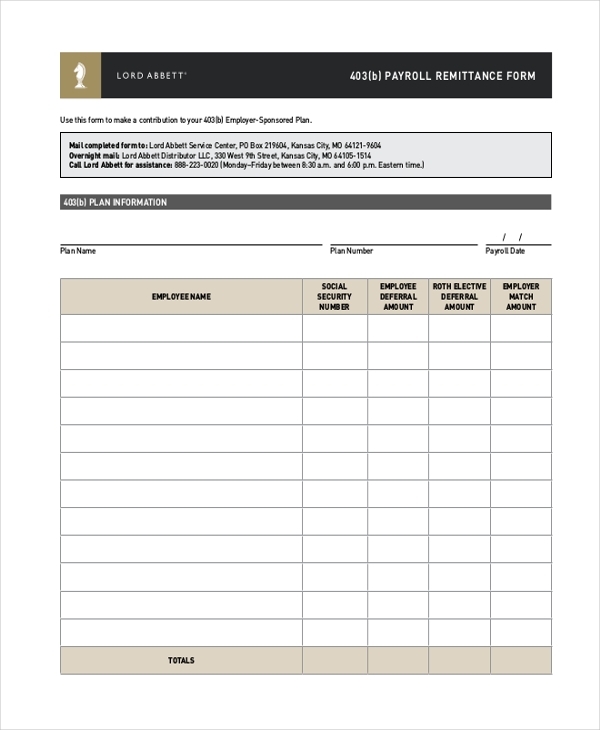 For bank account and tax purposes, payroll forms are required. The higher-ups of a company convene together and set out to fill business payroll forms for all or certain employees in the organization. Apart from personal details, tax status and recurring earnings/deductions and details of time off balance are also inserted in such forms. 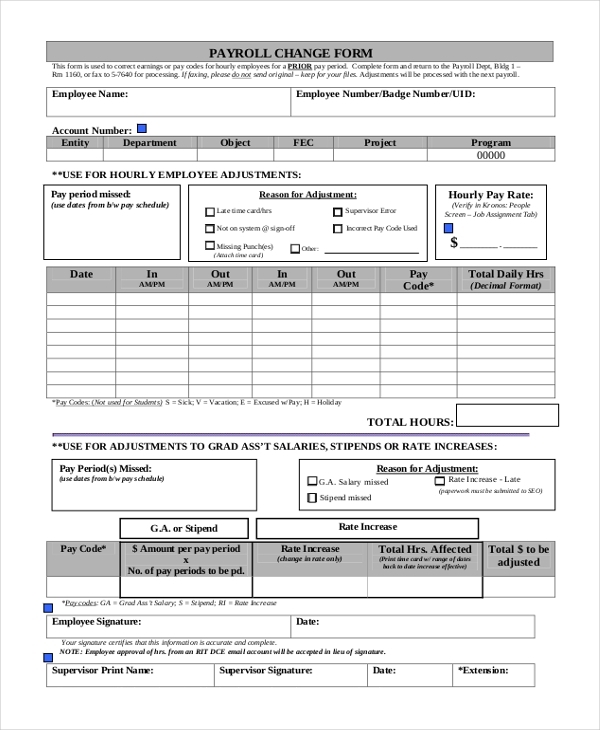 A basic payroll form contains all informational specifics of an employee’s days, dates and times or attendance and the corresponding payable amount for each is also specified. Lastly, the sum total (after all applicable deductions) is specified at the bottom end of the table. In many companies, weekly wages formula is followed. 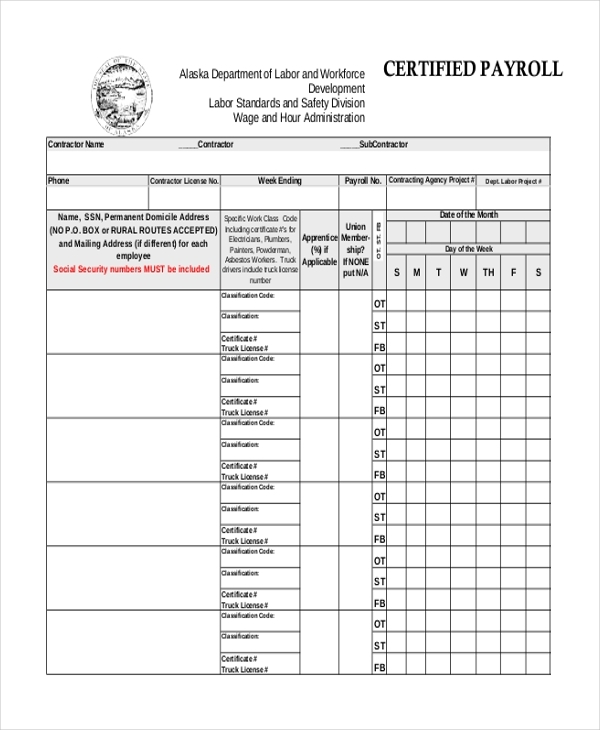 According to this system, a weekly certified payroll form needs to be populated with the relevant and accurate details of the workers who are eligible for receiving a weekly wage for the works they did. 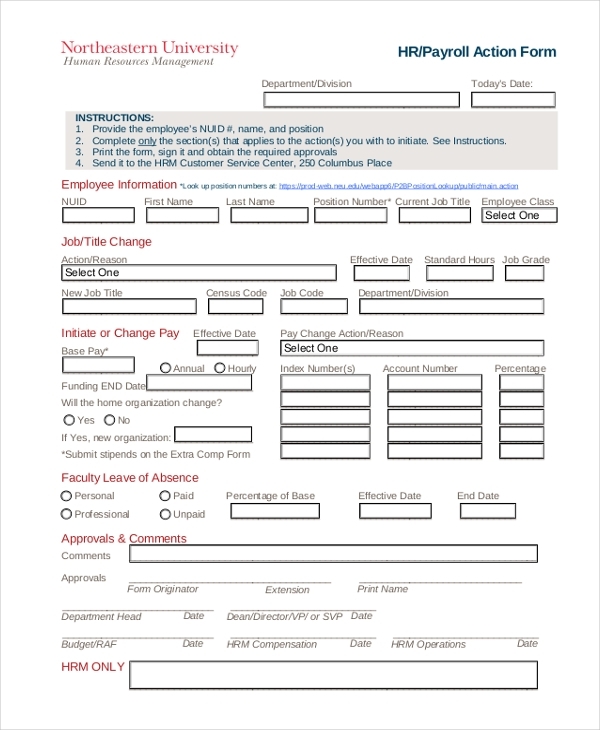 If an individual or employee requires a simple format payroll form for insurance or bank purposes, such a payroll form contains minimal fields wherein details such as employee name, phone, email, mailing address, insurance ID, and account number specifics need to be provided. 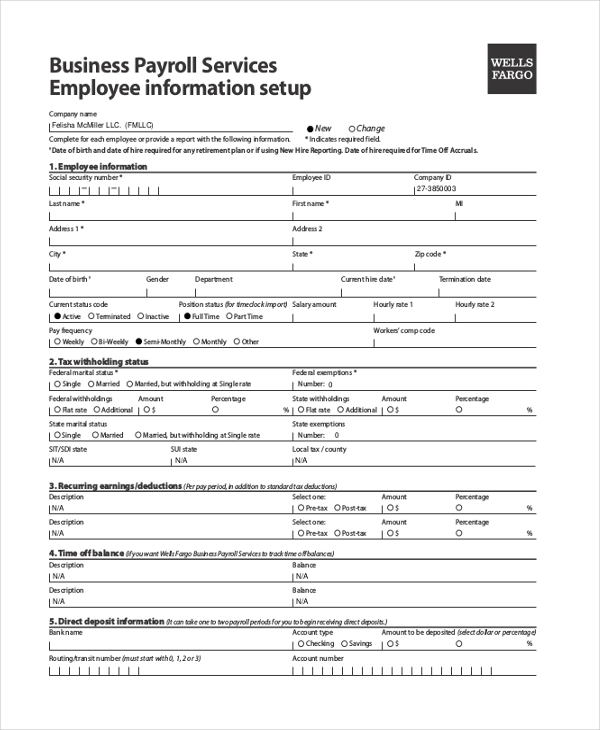 A Generic employee payroll form consists of multiple fields and blank spaces which need to be filled with employee’s name and other personal information, followed by his weekly and yearly salary figures. Also, discounts and deductions need to be mentioned (if any) and also vacation leaves details. In the event of salary appraisal or revision of a particular employee, HR managers must fill up an HR payroll form intimating the same. Fields included are Employee information, Job/Title Change, Initiate Pay or Change, Leave of Absence, Approval, and Comments. 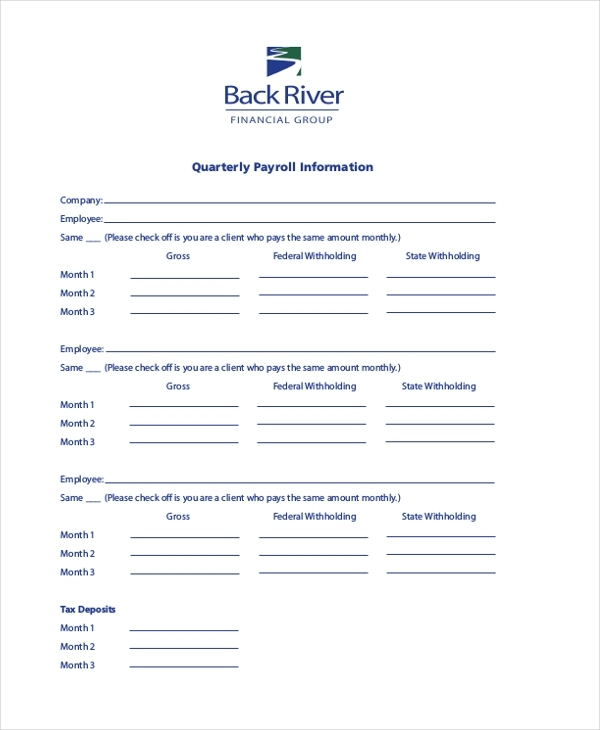 A quarterly payroll form is useful for companies that regularly monitor employee payroll activity on a quarterly basis. The salary generated during a three-month period is furnished in the blank spaces provided corresponding to the fields given. 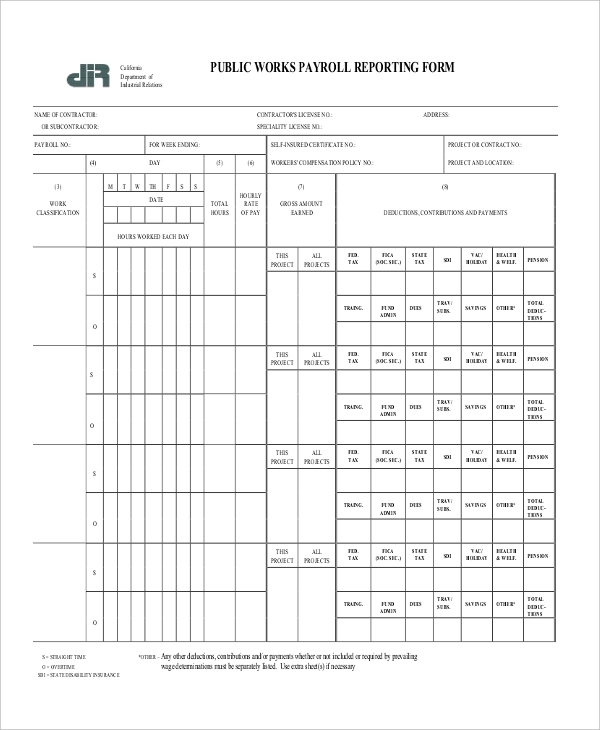 A payroll report form is a comprehensive, detailed form wherein the personal and work hours specifics of an employee are mentioned meticulously. Daily hours worked (straight time and overtime hours separately specified), also cost per hour also is indicated. For employees and workers involved in a project with weekly wages. Companies or project managers are known to maintain a weekly wages report in which weekly calculation of work hours, wages and deductions are given in a precise manner. 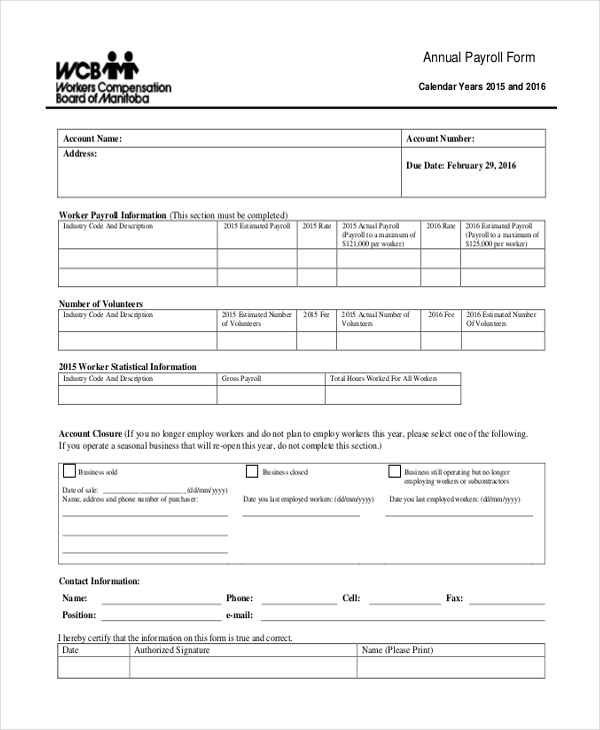 In case an employee has signed for a payroll deduction plan, he or she is required to fill and file a payroll deduction form furnishing personal and payroll amount information. In case an employee is sponsoring their family in another state or another country, companies allow employees to send remittance to their family members. An employer-sponsored plan is put into action for this purpose. Employee name and other relevant information are inserted in the table and columns provided. 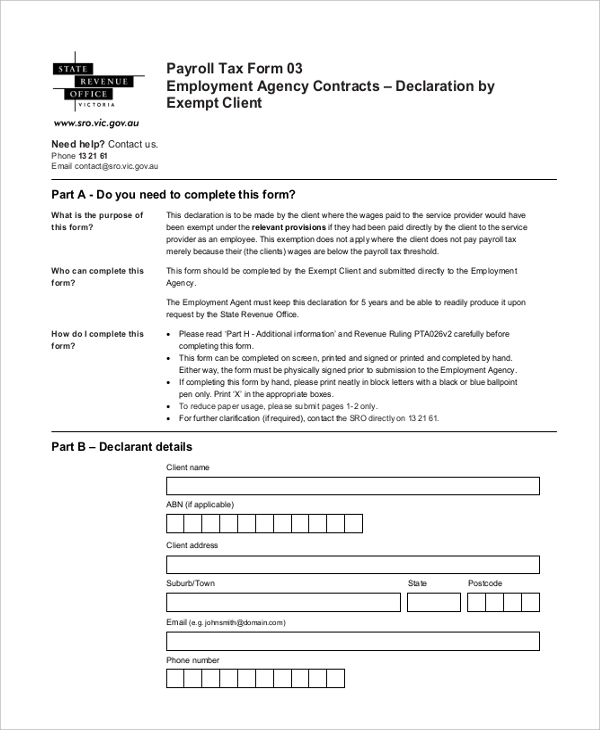 A payroll tax form is useful for employees that would like to declare their wages to the tax authorities and establish that wages have been paid directly to the service provider from the client, without third-party involvement. 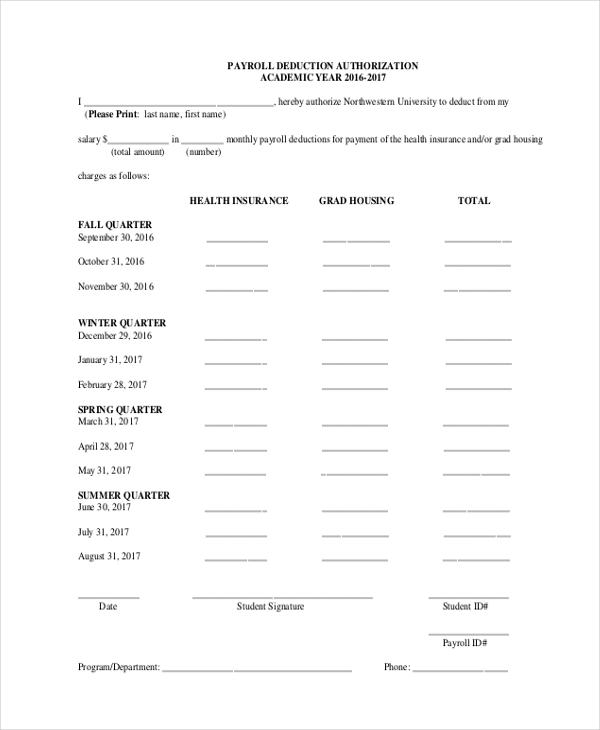 In many educational institutions, payroll forms are filled on a quarterly basis to keep track of payroll deductions of students who are also working as employees in the institution. The breakdown of deductions is dated and divided into one or two sections. In case there is any change in the payroll structure of an employee, a payroll change form needs to be duly filled stipulating the necessary adjustments or revision in the employee’s salary prior to the onset of the next pay period. In case an individual would like to donate a part of his or her salary towards a special cause, he or she needs to fill payroll registration form stipulating the salary amount that he or she wishes to get deducted and directed towards the donation account. 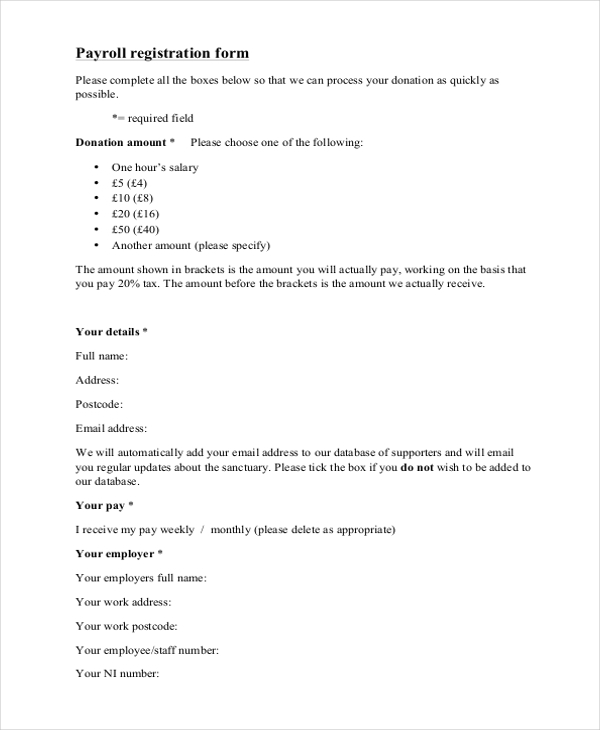 In such a form, the user, and his employer’s details need to be furnished, along with course salary specifics and donation amount by the former. 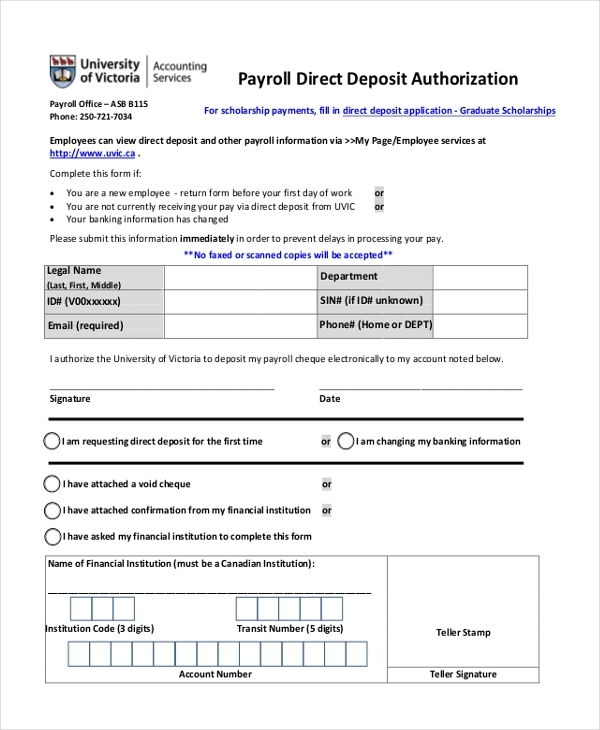 A payroll deposit form is used in situations where an applicant wants to give his consent to his or her employer to directly deposit their payroll check in the applicant’s account directly. Relevant personal details and bank account details need to be specified along with the date and signature. If a company is activating a pension plan for a particular existing or retiring employee, it is mandatory that payroll information is provided without any errors. Whether it is a new plan or an upgrade plan, employee payroll information and consent is required. 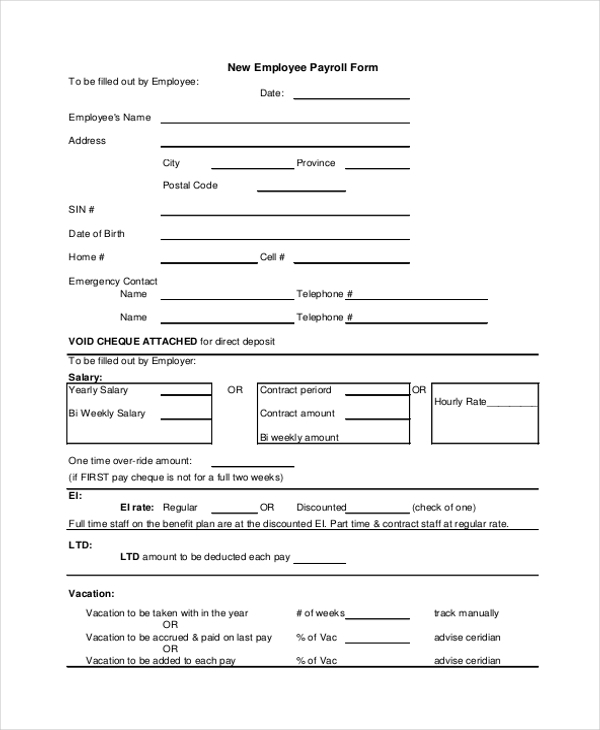 Payroll forms are used to regulate the salary flow of employees working in an organization. In the case of any miscalculation or misjudgment, authorities can always go back and refer to the payroll form of the said employee in order to assess and understand his or her payroll history. Payroll forms are important for maintaining transparency regarding payroll matters between employee and authorities in-charge. 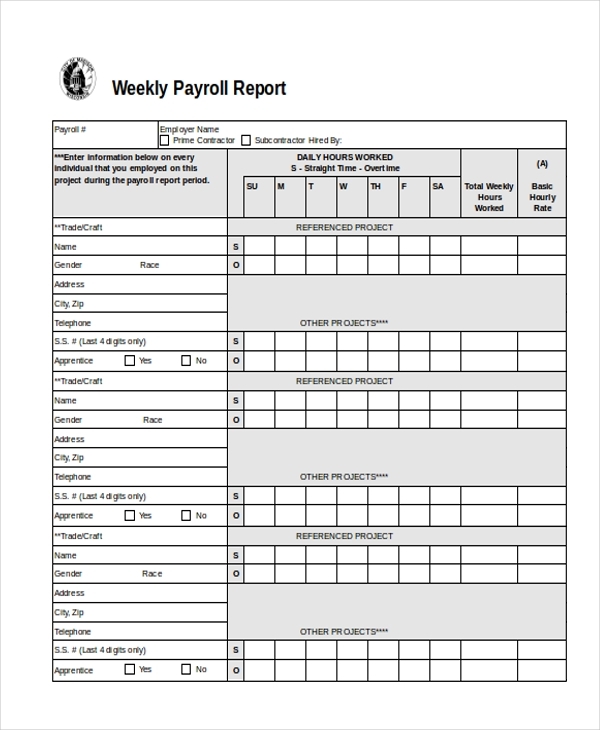 Ideally, employees are the target audience of payroll forms. However, in this case of insurance companies that are involved in employer and employee both are considered as an audience of payroll forms. 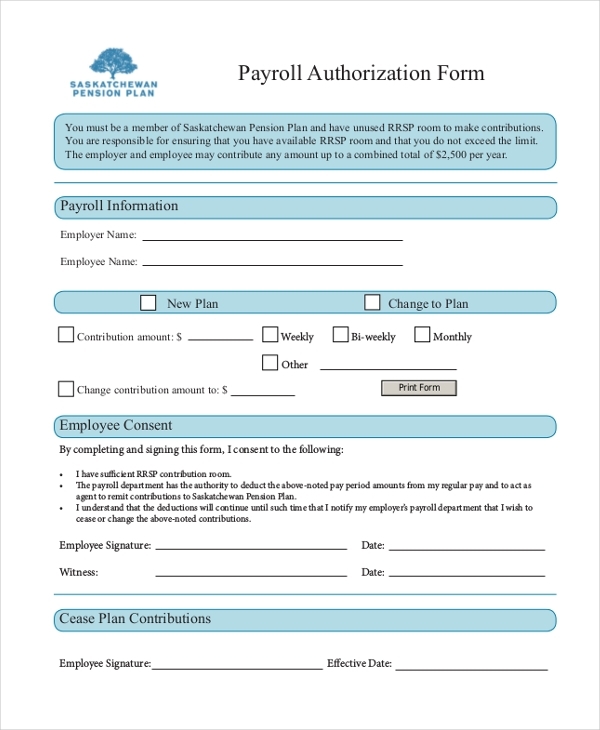 The format and design of payroll forms differ from company to company. 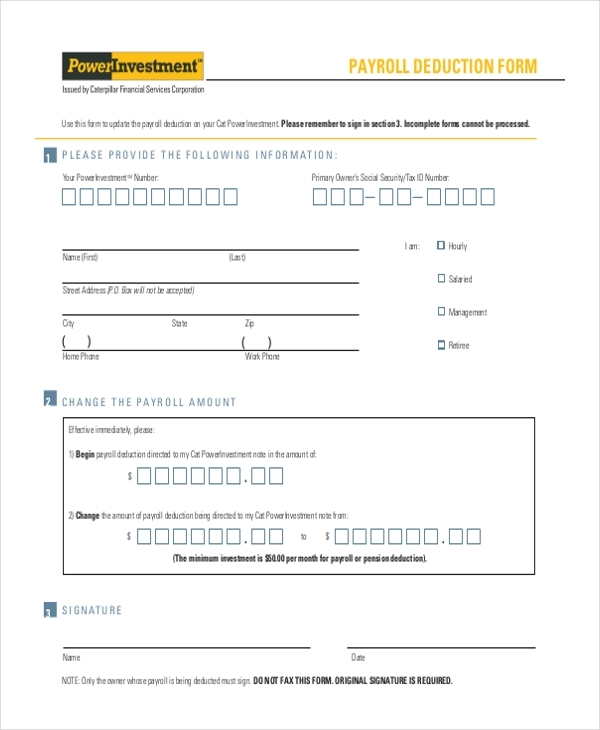 A payroll form can be extremely precise and straightforward and it can also be elaborate and detailed. 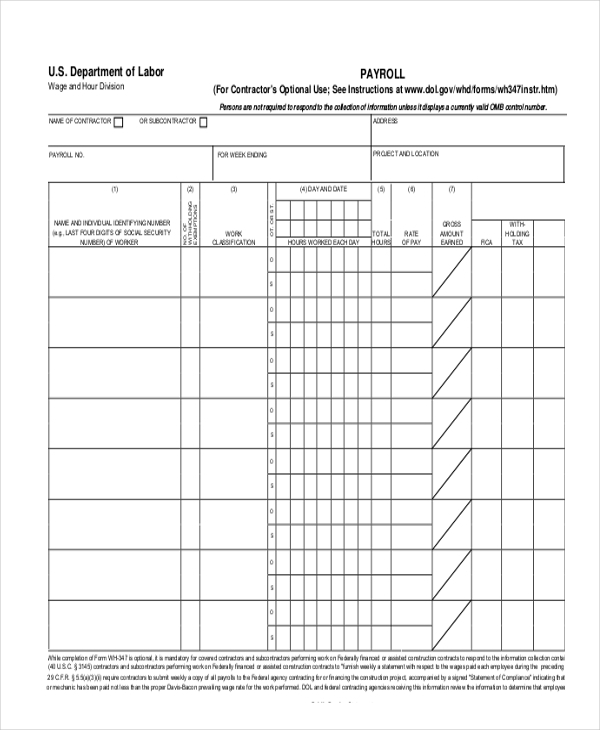 The primary audience of payroll forms are the employees of an organization. As stated earlier, the crux benefit of a payroll form is that it enables HR managers and bosses to keep an eye on the payroll activity of employees working in the company. In case an issue of conflict or revision pops up, employees or the management needs to fill and file the appropriate payroll form and take the necessary course of action. Payroll tasks and management are crucial endeavors. In order to ensure that payroll cycle of an employee or subject runs smoothly, it is important that payroll management is handled in a correct manner. This is achievable with the help of payroll forms. Depending on different situations, different kinds of payroll forms need to be populated and forwarded to the concerned parties.